At last we entered the final area, a little square enclosed by different buildings. Each one was somewhat squat, no more than one or two stories tall, with grey shingles. 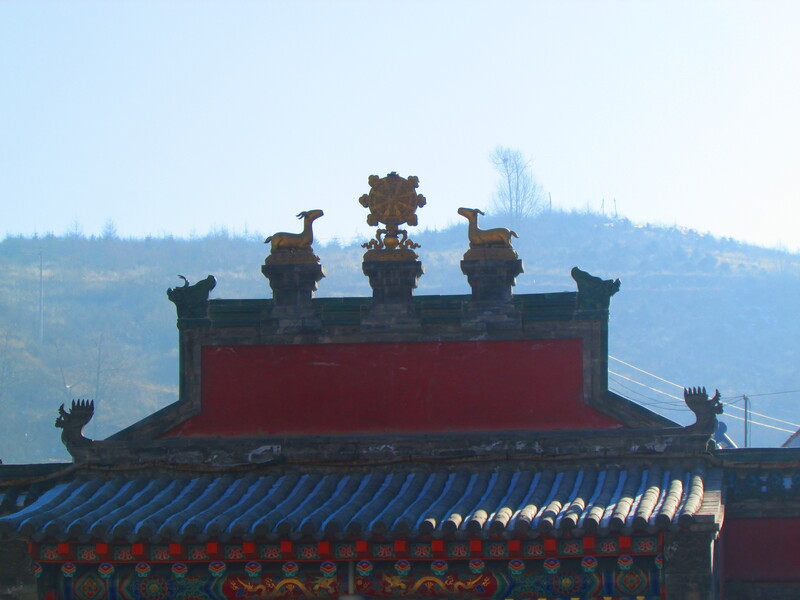 Everything looked almost stylized to the imagination of an Eastern temple. Out there in the cold near all the monks in red, it all felt very real regardless. The monks eyed us and we them, standing as strangers barred by language from a straight connection. Even if we had the tongue to tie our two groups together it would have been an entirely higher level of courage to break the ice. It was nothing particular about Tibetan monks. In the majority of temples we went to the monks did their own thing and let everyone else do theirs. The tour guide told us to sheath our cameras at this point. In a certain area we could take pictures of monks, buildings, whatever else. Inside buildings and deeper within the monastery, they disallowed photography. I felt somewhat glad for it. Pictures help with capturing and keeping a moment but not necessarily for enjoying it. It is a tricky tradeoff where I remember less of what I could not take a camera to, but absorbed more of it at the time. At this point we entered the Grand Golden Tile Hall. Here and in the Potala Palace we got cut off from our cameras and it made the dimly light and sublimely colored Tibetan tapestries come alive. You can see the gold tiles of the hall we would soon enter. The bright and glaring sunlight made its exit and only gentle lamplight wore on our eyes now. The intricacy of the tapestries and the cloth covering the hallways was so intense that it felt overwhelming to try and take it all in at once. All the complex interweaving patterns created a sense of what the world’s cosmological phenomenon might look like. Pockets of well-organized tomes stood not far off either, sparking off endless thoughts on what they contained. Wild parts of my mind flirted with ill formed ideas of tantric secrets, but it was more likely the scrolls contained sutras and religious history. Eventually we came to the large golden statue of Tsongkhapa himself, the man whose spiritual deeds sparked such grandeur. The golden statue itself was beautiful and awe inspiring in its own right, but the atmosphere meant everything here. A church inspires with ceilings that stretch on endlessly high, and cavernous expanses allowing all a seat. Kumbum felt small, but personal. The hallways were spacious enough, but crowded with so many banners and colors showered in dark light that in some way it felt packed and expansive at the same time. In this area we saw more monks and visitors giving offerings and sitting before the statue of Tsongkhapa. The holiness of the area radiated in a way I can only imagine Notre Dame or the Sistine Chapel or the Hagia Sophia might. A dear friend I had made on the trip remarked to me how incredible the experience felt to him. He called it one of the most intense experiences he had. I had to agree, and felt good doing so since I heavily pumped up Kumbum to him while we explored Xining. I try to keep a healthy balance between cynicism and romanticism, to not to get swept up into breaking things down into nothing or building them up so they become everything. Never forget to look up! Yet, Kumbum deserved respect and absolutely should radiate holiness and awe even by objective standards. 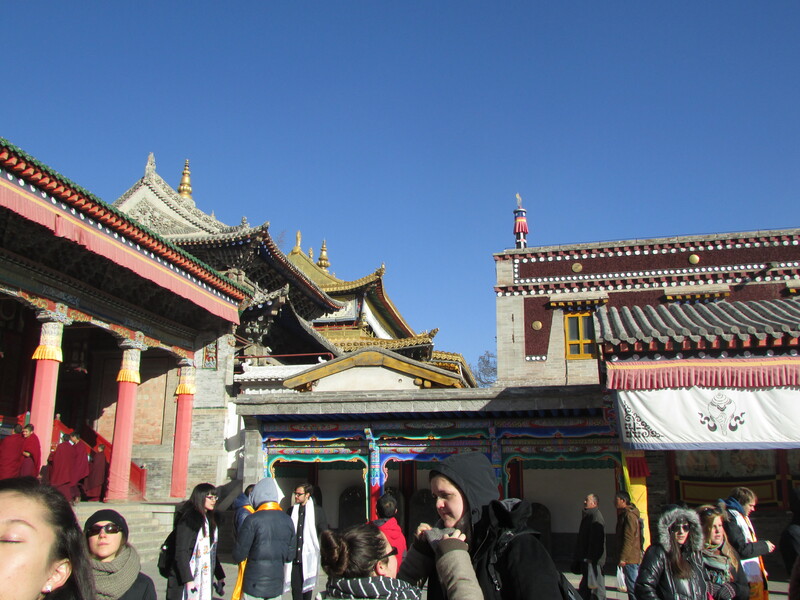 Kumbum is one of the oldest religious institutions in Tibet and second in importance only to Lhasa. It should inspire in the way Notre Dame might. Centuries of tribute and donation from a mostly poor peoples, centuries of elite support, centuries of a good section of many people’s resources funneled into this site. The result was sublime. As we loaded back on the bus, I felt enlightened by an understanding of how so many people could give so much of what little they had to a venture that never paid them back materially. Grandeur and awe incite such a flood of emotions that they become a payment all their own. As I reflect, it is not so unlike the sky scraping buildings of New York or the terrifying obelisk we dedicate to George Washington. Nation means nothing on its own, and neither does Capitalism, but seeing all that steel and all that marble help me admonish these ideas. The abstraction springs to life in form of the finest construction people can manage. Incredible skylines remind us of how far we have come. Named after businesses, they make remarks on what might have got us there, or at least paid for the construction. Marble monuments that seat Lincoln like Zeus in a hallowed hall solidifies America into a material realm. In Tibet the grandeur of golden Tsongkhapa does not seem so different, bringing to life an abstract idea of this man become sacred symbol. The thought makes me feel so close to so many far places but so grounded in my home. I could understand the motives and sentiments of almost any monument, but the true meaning is different. My fingers might grasp at the meaning of monuments, but I wondered how much I could ever close in on it without living in the society that made them. I still wonder if I can only properly feel the full cultural pull of the National Mall.